This article first appeared in City & Country, The Edge Malaysia Weekly, on July 24, 2017 - July 30, 2017. Late one Thursday night, we took a drive to Marina Square in Marina ParkCity in Miri, Sarawak. Brightly-lit pubs, cafés and hip coffee shops there were packed with people, a surprise to those of us who had not visited Miri in a while. The beautiful tree-lined streets and the new 15.7-acre landscaped Central Park with its waterfront boardwalk within the development were clear signs that this was not the Miri we used to know. “Much of the night life in Miri has shifted to Marina ParkCity and the Central Park has become a popular spot for people to jog and stroll in, complete with a beautiful view of the sea and the famous Miri sunset,” Perdana ParkCity group CEO Datuk Joseph Lau told us when we met him a week prior to our Miri trip. 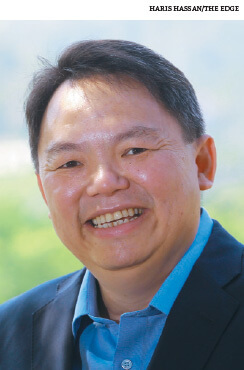 Lau, who took over as CEO late last year, joined Perdana ParkCity in 2010 as executive director. An accountant by profession, Lau was attached to IKEA Retail for 15 years and was instrumental in the setting up of IKEA in Malaysia and Bangkok, Thailand. Marina ParkCity is an example of the developer’s ability to transform an area in line with its vision “to create a sense of place for people who value family, neighbourhood, community, connectivity, and convenience”. However, as Lau notes, the ParkCity brand is still very much associated with the hugely successful Desa ParkCity in Kuala Lumpur. “The ParkCity brand has been defined by the success of our master planned township Desa ParkCity, so much so that a lot of people do not know us as a master developer. We look at this as a positive thing as it represents a strong track record of what we can deliver. We introduced the first landed strata homes in the country and took great care of our quality and detailing to realise the vision to create one of the best community living spaces in the Klang Valley,” he says. He stresses that Perdana ParkCity is a regional property development and investment company and has successfully replicated master-planned townships in Miri with Marina ParkCity and ParkCity Hanoi in Vietnam. Lau’s priority is to further strengthen the ParkCity brand as a regional group, noting that it does more than just property development. Perdana ParkCity is the property arm of Sarawak-based conglomerate Samling Group, which was founded in 1963. Samling is involved in forest resource management, oil palm plantations and automotive, among others, and has a global work force of more than 16,000. The investment portfolio of Perdana ParkCity includes education, hospitality and retail assets such as ParkCity Everly Hotels in Miri and Bintulu, Sarawak; The International School at ParkCity in KL; and The Waterfront neighbourhood mall at Desa ParkCity. “We are expanding our international school in Desa ParkCity due to overwhelming demand and in the process of finalising our international school in Hanoi, Vietnam. Our hotels in Miri and Bintulu will be undergoing renovation works soon. We also have Ascott Somerset Serviced Suite under construction in Marina ParkCity,” Lau says. Despite much talk about the volatile market and the pressure faced by the property industry, Lau believes the Klang Valley holds much potential. Perdana ParkCity’s strategy is to remain innovative and introduce differentiated products that suit current market trends. “We are looking at a few launches in the second half of the year in Kuala Lumpur and Hanoi. In March, we launched the first two phases — Melia Homes — of the master-planned township, ParkCity Eastwood, in Miri. Melia Homes comprises 1,075 units of 2-storey landed PPA1M (Perumahan Penjawat Adam 1Malaysia) homes,” says Lau. The 2,818-acre ParkCity Eastwood is the first integrated development in Miri and will have the the first PPA1M neighbourhood. The township is directly linked to the Pan Borneo Highway, which will connect Sabah, Sarawak and Brunei. The development will comprise mixed commercial and residential projects with schools, parks and others. The intermediate units of Melia are priced at RM300,000, while the price of the corner units will depend on the land size. “ParkCity Eastwood has the DNA of ParkCity with the parks, retail and other elements. Close to 500 units have been taken up by civil servants. It’s a different kind of living on the east side of Miri and there will be more landed homes because of its location,” says Lau. In Kuala Lumpur, Perdana ParkCity recently acquired an 80-acre tract near the Jalan Kuching/Jalan Kepong interchange. The parcel is slated for a transport-oriented development (TOD), scheduled to launch in the first half of 2018. Located about 7.5 km from Desa ParkCity, the mixed-use development will be carried out over 10 phases and will include condominiums, SoHo, offices, high-street retail, shopping mall and hotel serviced suites. The project has a maximum plot ratio of 5.5 and will be anchored by a shopping component, with 840,000 sq ft of net lettable area, which will be linked to a MRT station on the Sungai Buloh-Serdang-Putrajaya line that will completed by June 2021. “We are also looking at another master-planned township within the Klang Valley but I can’t share details just yet. We are keeping our fingers crossed. We will be looking at developing multiple townships in the Klang Valley. Of course, it is challenging to get large pieces of land so close to the city but it can’t be too far as well. That’s the challenge,” says Lau. Over at the 473-acre Desa ParkCity, only 70 acres remain undeveloped. Some 2,888 homes, a neighbourhood mall, Central Park, clubhouse, hospital, international school and Plaza Arkadia have been completed in the township since 2002. Currently, 469 homes are under construction. “We have a few things in the works and we will have more high-rise residential projects going. As for The Waterfront, we are looking to enhance the retail experience. It’s close to 10 years old, so I think it’s time to see what else we can do. “Plaza Arkadia is more of a regional centre and more of an F&B retail experience while The Waterfront is more of a neighbourhood centre. We handed over Plaza Arkadia in January and tenants are starting to come in. Village Grocer will be the supermarket operator, taking up about 26,000 sq ft. It is targeting to open in September,” says Lau. Also coming up in Desa ParkCity is the 7.16-acre South Brooks. Comprising 920 condo units spread over two 40-storey towers, it has a density of 128 units per acre. Built-ups range from 876 sq ft (2-bedroom) to 1,535 sq ft (3-bedroom + 1 study). The indicative selling price is an average of RM700 psf. It has a GDV of RM780 million. “The freehold South Brooks is priced at a more affordable level and the sizes are smaller as well compared with our other high-rises. We are planning to launch in 3Q2017,” says Lau. In the commercial segment, Perdana ParkCity is looking at developing medical suites to complement the existing ParkCity Medical Centre. “Because of the medical centre, medical suites will be interesting. And because of the environment, facilities, walkability and the medical centre, quite a few parties have approached us about developing independent living units for the elderly. We are exploring ... but nothing is firm yet,” says Lau. At the 190-acre ParkCity Hanoi, the developer will be introducing villa parcels and Phase 3A of its ultra luxurious superlink villas and semi-detached homes by the end of the year or the first quarter next year. ParkCity Hanoi is expected to have 7,500 houses, a town centre, public facilities and schools upon completion, and has an estimated gross development value of RM7 billion. “ParkCity Hanoi is looking great with the newly completed clubhouse. We are now in the planning stages of the retail component,” says Lau. “We are also actively looking at more land bank within the Klang Valley as well as abroad but the concentration will be in the Southeast Asia region for the time being,” he adds. Apart from the undeveloped 70 acres in Desa ParkCity, 80 acres in Kepong and 190 acres in Hanoi, Perdana ParkCity also has 60 acres in Kuching and 3,647 acres in Miri. The story of Marina ParkCity started about three decades ago. Miri, a coastal town bounded by the South China Sea and Canada Hill, started facing a land shortage for expansion in the 1990s. Tidal waves caused continuous erosion of its coast while the moving sandbars and heavy siltation of the Miri River estuary were serious impediments to navigation by vessels — a matter of concern for the oil and gas sector as well as fishermen. A joint venture between the Land Custody and Development Authority and Samling Group was formed to address the land shortage through reclamation and long-term measures were put in place to address the environmental issues. The 550-acre Marina ParkCity is built on the reclaimed land. 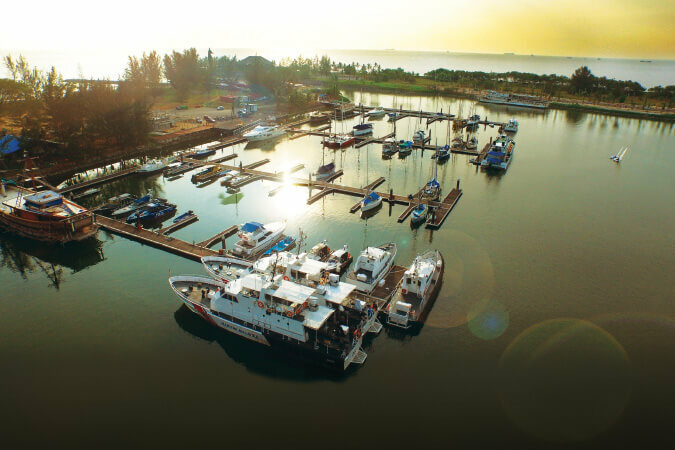 “Marina ParkCity is the realisation of a vision to expand Miri city towards the sea with a mixed-use master plan, setting a new benchmark for livability and accessibility for all residents of Miri and the region. It is designed to signify the importance of a sustainable city to daily lives and the creation of lively, safe, sustainable and healthy cities,” says Lau. Marina ParkCity has an estimated GDV of RM3.5 billion and 13.6 million sq ft gross floor area in planned commercial space. According to Lau, the development has created a strong urban connection to the ocean waterfront that the historic Miri was never able to realise. “The development will create an active Waterfront District that will establish itself as a regional destination and become a powerful amenity for the people and region. It will create economic demand for businesses to relocate to Marina ParkCity and introduce a comprehensive environment strategy across the site, which will position Marina ParkCity as the first eco-downtown in East Malaysia,” says Lau. The development is divided into the Waterfront District, Market District, RiverPark District and CityFront District. The Waterfront District is a picturesque seafront destination with an extensive boardwalk and linear park at the edge, while the RiverPark District will set commercial components among parks, plazas and fountains. The CityFront District will be Miri’s new modern government and financial hub and the Market District will offer a sensory experience and a venue to showcase local market heritage. Among the completed components are the marina, which is often used for international events and festivals; Marina Square I and II; and residential land parcels. Marina Square I, launched in 2012 comprises shop offices with pedestrian connectivity, while Marina Square II, launched in 2013, consists of shop offices with alfresco dining areas and the central boulevard. All these are within the WaterFront District. The 3-storey shopoffices in Marina Square I and II were launched at RM1 million and RM1.2 million respectively. They are currently selling at about RM1.6 million. The ground floor commands a rental rate of RM3,000 to RM4,000 per unit, while the upper floors go for RM1,000 to RM1,500 per unit. Meanwhile, the 15.7-acre Central Park and Miri Times Square are under construction. The former is a public park with a waterfront boardwalk is designed to be the best family destination in Miri, and is the first step in the developer’s vision to link Miri to the sea. The latter will comprise retail and office spaces around a public square as well as SoHo units, hotel and a supermarket. “Our master plan has been very well received by the market locally and regionally. When we launched the very first SoHo - Kenyalang Corner - comprising 100 units, we achieved 80% sales in just two weeks and they were all sold within three months. “The introduction of the first Starbucks drive-through and opening of F&B outlets and offices in Marina Square 1 and 2, have made the environment vibrant and thriving,” says Lau. “Marina ParkCity is different from the other developments in Miri. We adopted a lot of what we learned from the Klang Valley, such as no open drains and covered, wide walkways. Miri Times Square will become a financial centre, which Miri doesn’t have now. Already, banks like Maybank and Public Bank, and Public Mutual are coming in. “Then we have Columbia Asia Hospital relocating to Marina ParkCity. Columbia Asia is already in Miri but is currently operating in a shophouse and is looking at purpose-built building within our development,” says Lau. As for the Market District, the plan is to relocate the Miri central market there. In the next couple of years, the focus will be on Miri Times Square, where the 128-room Somerset Serviced Residence and SoHos are located. Building in Miri is not without its challenges. “At the end of the day, pricing is always a factor. For us, delivery and quality are crucial. Due to the small market, we have to manage what it can take. It’s challenging, so we just have to pace ourselves according to what the market needs and do something different,” says Lau. “Most of our buyers are Sarawakians and those who have moved overseas who believe in purchasing for long-term investment. There are also buyers within the region who are mainly business owners looking at expanding their businesses,” adds Lau. Ultimately, no matter what Perdana ParkCity does in the future, it will aim to be the property development and investment group of choice, inspired by innovation, quality and sustainability and its stakeholders, Lau sums up.